Arihari is small. Reaching only 12hh in height he's slender – built slim with long legs. Many of his features are soft, feminine in appearance with a distinctive youthful touch. 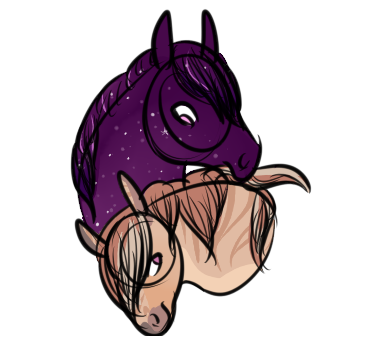 His base color is a golden dun with dark chestnut stripes running across his body. Lighter dunalino is painted across him in large patches. These are most notable in the way that it splits his face into uneven portions, the large marking down his neck, and across his back. Where the paint markings run down his legs there is a slight difference in the barring and stripes. His mane and tail are two different colors that follow the pattern of his markings. Much of his mane is a rich chestnut with the occasional bit of flaxen intertwined. While most of his hair is quite long – to the point of brushing the ground – he does keep it up in messy braids in order to maintain it better. Some of his forelock is the exception to this. On his left side he has a single braid running down the length of his face, but on the left his hair is kept free. His tail matches his mane in both color and length, and it's also kept wrapped in a messy braid. Another notable aspect of Arihari's appearance is his oddly colored eyes. His left is a bright pink while his right is an equally bright gold. Lastly comes the one aspect that he isn't proud of. His horns were seated high upon his head – tucked behind his ears, and his mess of hair. It was a pair of delicate, curled spires that never had much of a chance to grow. He lost both in a tragic, cruel fashion. Instead, he bears twin scars with the slightest of bumps from the bone underneath. Both of these scars are usually hidden – tucked away. Thus far his horns have yet to regrow. It is unlikely that they ever will. Arihari is generally free-spirited when it comes to his own. While he is currently lacking horns – something of a sensitive topic – he did have them. They were once a proud feature of his bloodline, and they are something he clings to still. He cherishes what he is and holds a mild distrust towards strangers or those not of his people. Past experiences haven't led him to have much faith but he tries to believe that everyone is an individual. He keeps his friendly smiles and gentleness with everyone but he questions the motives of others. Fiercely loyal, Arihari looks after those he calls his own. While he holds much distrust he remains a kind soul and would not - could not - turn away someone in need. He is also startlingly blunt and unafraid to speak his mind, despite his small size. He has no qualms about standing up to injustice - something that has and will continue, to get him into difficult situations. He is also a strong believer in his homelands religions and gods. As he is unaware of any other lore, he keeps to his beliefs. Arihari is somewhat closed off when it comes to the topic of other gods. He's much more content to keep to what he knows. 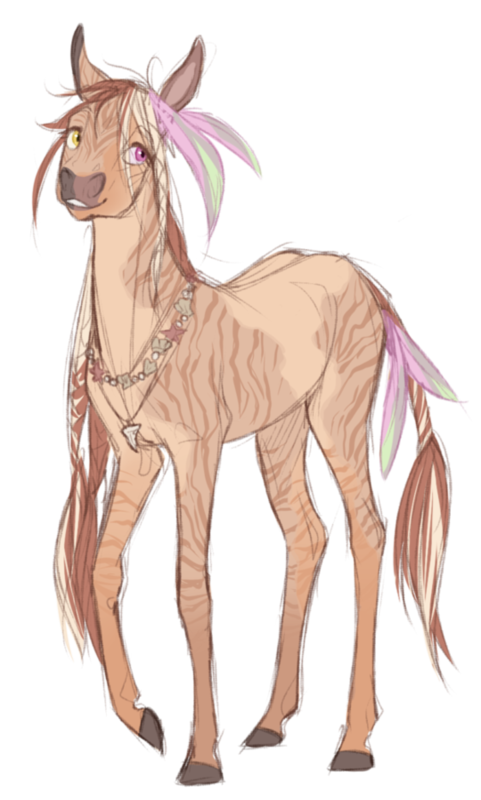 Arihari was born in the towering, distant woods of Sirastir to a small nomadic band of equines. He was the youngest and grew under the watchful eye of his tight-knit family. They kept to themselves and a few other small nomadic neighbors. His early life was one filled with joy and ease. He was taught how to live from the forest - how to take and give in return. His grandmother would often pull him aside as well and teach him her craft of weaving. He learned intricate patterns and how to delicately style and braid. It was a simple life and one he would not have traded. However, the fates decided differently for the young boy. It was on a journey of trade when his family was attacked by war-hungry northerners who wanted their horns for their false gods. The people of the north believed the woodland inhabitants held healing powers within their horns - something that was sought after greatly. Arihari remembers little of the initial attack. His memory flickers and he recalls his frantic heartbeat before clarity and pain returns. He had been stripped of his own small, delicate pair of horns. The attack itself left him with little remaining family. A mother, a brother, and his grandmother. Days were spent in mourning and recovery as the small familial group pulled themselves together. They sought out another nomadic band - a larger group they had been well acquainted with and were welcomed with open arms. As word of the attack spread tension rose between the Northerners and the Woodland groups. Those carefree days had long since past. As he came into his teenage years he made a peculiar friend. Despite his caution there was still an abundant amount of trust and love within the small boy. When he came across the strange vagabond stallion he was intrigued. A hunter, a shadow, a mystery that he wanted to unravel and know. The stallion tried to send the youth on his way but Arihari would not have it. Anduit wanted nothing more than to keep everyone at a distance. It was through Arihari’s insistence that the vagabond finally allowed the child a glimpse of friendship. The pair were near inseparable for a time before Anduit began to insist that he needed to leave the woodland realm. It was rare for those of his culture to leave home. Arihari knew this. His people stayed with their own and rarely ventured beyond the borders into the chaotic world outside their grand forest. However, in meeting Anduit a sense of adventure awoke within the young boy. He wanted to see the world, taste the lands outside his sheltered home. He was given a tearful blessing from his mother as he finally left the place he called home. His journeys with Anduit brought him many places within the Three Kingdoms. Sirastir was far behind when he laid eyes upon the white stones of Irialin, or the vast oceans of Oris. However it was the snowy mountains of Marothel and the black castles that brought forth the only hesitation in Ari. The Northern lands were a terrifying place to encounter. Even Anduit seemed uneasy as they ventured across the great peaks. It was during their time here that Arihari’s skill was noted. He was exotic and strange in the Northern world, with an ability to style in ways that were just as otherworldly. He was beckoned to the castle by nobles many times over the course of a few months. It was only a matter of time before he was summoned by the royal family themselves. Anduit was apprehensive and spoke only warnings when it came to the people of Marothel. They were not to be trusted. Arihari would come and go from the castle, a welcomed source of entertainment for the otherwise vicious King and his kin. Apprentice: At this stage Ari can move small objects with his mind - most notably being hair. He has a particular knack and love for styling hair and at this stage of his abilities, it seems to be the most he can do. Prolonged use will cause severe headaches. Adept: He is able to use his abilities longer and can now move slightly larger objects the size of watermelons. Again prolonged use will cause headaches and should he try to move something out of his ability range it could leave him physically and mentally exhausted for a few days. Master: Far larger objects can be moved now - some rivaling the size of Ari himself. He can levitate and move them as he wishes. Should enough effort be put behind it he may be able to throw an object. Pushing himself too far will again leave him aching and exhausting. Virtuoso: Size matters little now. Arihari is able to move objects larger than himself should he wish it. However there are still limits - the larger the object the more energy it consumes. Should he try to move something extremely large he risks complete exhaustion or even death.